(Nanowerk News) We've all heard that "it's not wise to use a cannon to kill a mosquito." But what if you could focus the cannon's power to concentrate power into a tiny space? In a new study, University of Missouri researchers have demonstrated the ability to harness powerful radioactive particles and direct them toward small cancer tumors while doing negligible damage to healthy organs and tissues. 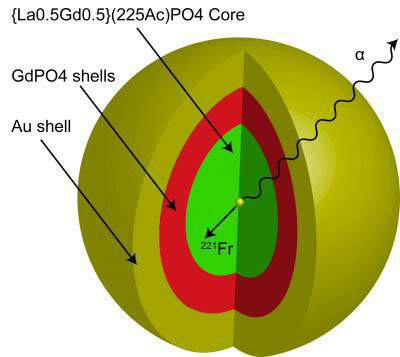 The study is being published this week in PLOS ONE ("Gold Coated Lanthanide Phosphate Nanoparticles for Targeted Alpha Generator Radiotherapy"), an international, peer-reviewed and open-access publication. Typically, when radiation treatment is recommended for cancer patients, doctors are able to choose from several radiopharmaceuticals that use low-energy radiation particles, known as beta particles. For years, scientists have been studying how to use "alpha particles," which are radioactive particles that contain a large amount of energy, in cancer treatments. The challenges to using alpha particles, which are more than 7,000 times heavier than beta particles, include confining the powerful alpha particles in a designated location inside the body while preventing radiation from wandering to healthy organs and tissues. "If you think of beta particles as slingshots or arrows, alpha particles would be similar to cannon balls," said J. David Robertson, director of research at the MU Research Reactor and professor of chemistry in the College of Arts and Science. "Scientists have had some successes using alpha particles recently, but nothing that can battle different cancers. For example, a current study using radium-223 chloride, which emits alpha particles, has been fast-tracked by the U.S. Food and Drug Administration because it has been shown to be effective in treating bone cancer. However, it only works for bone cancer because the element, radium, is attracted to the bone and stays there. We believe we have found a solution that will allow us to target alpha particles to other cancer sites in the body in an effective manner." Robertson and researchers from Oak Ridge National Laboratory and the School of Medicine at the University of Tennessee in Knoxville used the element "actinium," which is an element known as an "alpha emitter" because it produces alpha particles. As it decays, actinium creates three additional elements that produce alpha particles. Due to the strength of these particles though, keeping the elements in place at cancer sites was not possible, until Robertson and Mark McLaughlin, MU doctoral student and co-author on the study, designed a gold-plated nanoparticle that serves as a holding cell for the elements, keeping them in place at the cancer site. Robertson's nanoparticle is a layered device. At the core is the original element, actinium. Robertson's team then added four layers of material and then coated the nanoparticle with gold. This made the nanoparticle strong enough to hold the actinium – and the other alpha emitters that are eventually created – long enough for any alpha particles to destroy nearby cancer cells. "Holding these alpha emitters in place is a technical challenge that researchers have been trying to overcome for 15 years," Robertson said. "With our nanoparticle design, we are able to keep more than 80 percent of the element inside the nanoparticle 24 hours after it is created." While alpha particles are extremely powerful, they don't travel very far, so when the nanoparticles get close to cancer cells, the alpha particles move out and destroy the cell much more effectively than current radiation therapy options, Robertson said. "Previously, basic research had established that scientists can attach antibodies onto gold nanoparticles that help drive the nanoparticles to the tumor sites in the body," Robertson said. "Without that groundbreaking work, we would not have been able to put this puzzle together." The early-stage results of this research are promising. If additional studies are successful within the next few years, MU officials will request authority from the federal government to begin human drug development (this is commonly referred to as the "investigative new drug" status). After this status has been granted, researchers may conduct human clinical trials with the hope of developing new treatments for cancer.